Dr. Vessel and her staff are committed to providing thorough, gentle treatment for your healthiest smile. Benjamin Franklin once said, “an ounce of prevention is worth a pound of cure.” This is particularly true in dental health. Our hygiene department concentrates on preventing both tooth decay and gum disease. To improve a smile, Dr. Vessel’s office provides many options to whiten teeth with in-office treats, over-the-counter and take-home systems. She also reshapes teeth, support structures, and offers porcelain veneers, ceramic crowns. Not all teeth can be saved by modern dentistry. Sometimes we must remove a tooth or teeth with a process called an “extraction.” If decay has consumed the entire tooth or a tooth is loose due to gum disease, it may be better to remove it. 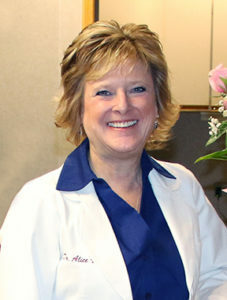 Dr. Alice Vessel uses state-of-the-art equipment to treat gum disease, perform root canals, and restore smiles through surgical implants and cosmetic veneers. Dr. Vessel is a dentist they can trust…and a trusted friend. 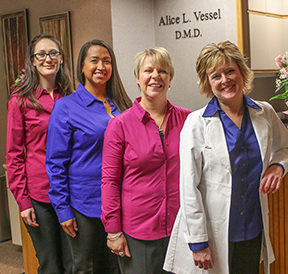 Treating patients with compassion and practicing with integrity, Dr. Alice Vessel, DMD and her caring staff ensure that your experience at the dentist is the best it can possibly be. Conveniently located in central Colorado Springs, Dr. 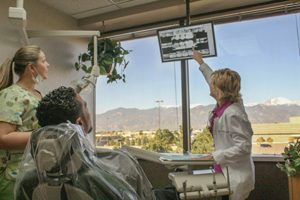 Vessel has been serving the Pikes Peak Region with exceptional individualized dental care since 1999. Spending time to get to know each patient and foster a personal relationship, Dr. Vessel and her staff are committed to providing thorough, gentle treatment for your healthiest smile. 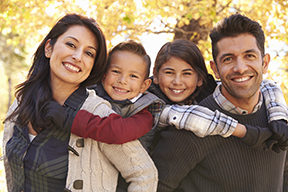 Family-oriented and dedicated to personalized care. Dr. 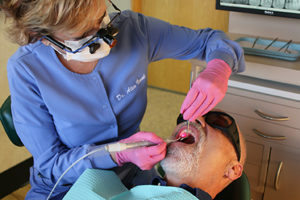 Vessel and her staff focus on providing gentle, full-service dentistry for patients of all ages. Highly trained and using state-of-the-art equipment, our dental team approaches each patient's oral healthcare with compassionate professionalism. Dr. 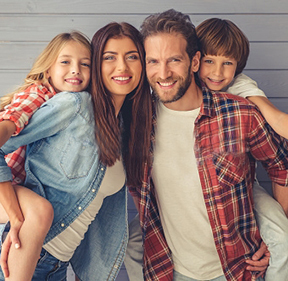 Vessel and her team of dental professionals provide comprehensive services for you and your entire family. From a child's first dental check-up to fitting custom-made dentures at age 90, every treatment is focused on giving you the healthiest, most confident smile. Dr. Vessel and her team deploy digital X-rays, IV sedation, laser technology and the best capabilities possible to ensure you receive the best treatment for the best outcomes for you and your family. Our goal is to listen to our patients concerns and provide the best possible results. Every patient is unique so we provide customized care on an individual basis. Our patients satisfaction is our number 1 goal.